Girls make great superheroes, too! We agree, Giggle Guide! The launch of this dynamic duo, brim-full of inspiration for girls, is a hardcover book in which Little Big-Heart introduces readers to his first recruits, three amazing real-life superheroes who join the GGC Alliance and share their Ignite Good! stories. Let’s hear it for the girls, especially those who hanker after the same special powers afforded to boys. Today’s girls go to the same schools, study the same subject matter and play all manner of rough and tumble sports. Little girls grow up to be lawyers, astronauts and neurosurgeons so why shouldn’t they start flexing their powers young? Dressing up is a great way to try on an ambition. While neither boys nor girls can fly (but don’t tell them), both can feel strong and powerful when emulating a character who can outrun the wind and zoom around the stars. Boys are regularly given a chance to be superheroes. Playing a dynamic role gives girls a marvelous gift that sets them apart and makes them relish their potential. Bring on energy and authority and encourage girls to dream big; it can start with something as simple as a cape. Who knows? That little bundle of pink and cream might just grow up to be a world leader! Capes to thrill girls come in a wide variety of colors and patterns from PowerCapes. These capes, made especially to fit children, are 22 inches long, the perfect fit for young ladies aged two to seven. PowerCapes are great birthday party favors or use them as a party theme so guests can swoop and fly together. Capes can be ordered with a girl’s initials adorned with a shield, circle, star, heart or zillions of other designs. Want to bring smiles to shoppers’ faces? 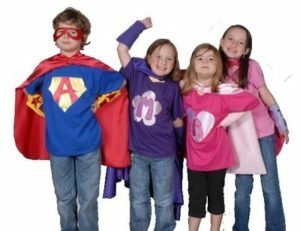 Stock up on capes in bright colors including red, blue, yellow and green and show customers the many ways they can personalize the cape that will enthrall a little miss. PowerCapes can be ordered with numerous emblems including a puzzle piece, heart, princess crown, star and flower. Dazzle customers with a red cape featuring a yellow lightning bolt or a bubblegum pink cape with a purple flower. Seven emblems are available already combined in various color combos so there are plenty of eye-catching choices. How about a Halloween costume suggestion of a light pink cape with a fuchsia sparkling crown? An outfit like this will bring girls to the front of the trick-or-treat line. For fun and fantasy you can’t go wrong with PowerCapes. Make way for the brand new Global Game Changers, a team of fictional superheroes led by Global Girl. GG and her sidekick, Little Big-Heart are in it to recruit real life kids who want to make the world a better place by doing good for others without expecting anything in return. The launch of this dynamic duo, brim-full of inspiration for girls, is a hardcover book in which Little Big-Heart introduces readers to his first recruits, three amazing real-life superheroes who join the GGC Alliance and share their Ignite Good! stories. The real-life kids featured in the book are Phoebe, a Californian, who makes the world better by helping a Feeding America Food Bank; Jaylen from Florida who overcomes being the victim of bullying and starts an organization to help fight bullying against others called Jaylen’s Challenge; and Hannah from Ohio who helps fight poverty through an organization she started called Hannah’s Socks that gives socks to people in need. The Global Game Changers book ends by asking readers to join the Alliance by visiting The Global Game Changers interactive web community at www.theglobalgamechangers.com. 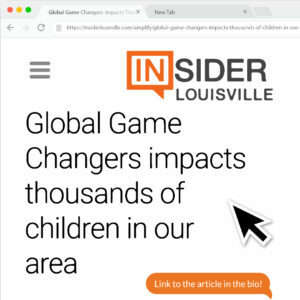 By clicking onto the site, kids can share their Ignite Good! 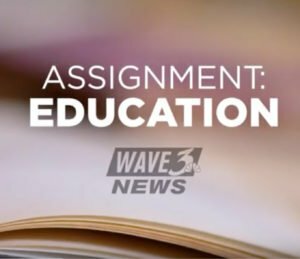 stories, learn how to use their talents to affect things they are passionate about, have fun, and be empowered to help make a difference in the world. The book, aimed at kids aged 4-10, is 32 pages with full color illustrations. 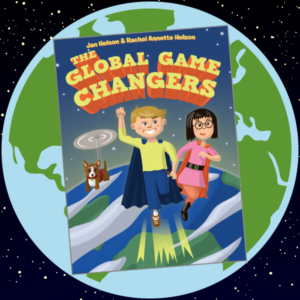 The Global Game Changers is the brainchild of philanthropist Jan Helson who developed the concept and wrote the book with her daughter, Rachel, who also did the illustrations.